Gail A. Eisnitz, winner of the Albert Schweitzer Medal for outstanding achievement in animal welfare, is the chief investigator for the Humane Farming Association. Her work has resulted in exposés by ABC’s Good Morning America, PrimeTime Live, and Dateline NBC, and her interviews have been heard on more than 1,000 radio stations. Her work has been featured in such newspapers as the New York Times, Miami Herald, Detroit Free Press, Texas Monthly, Denver Business Journal, Los Angeles Times, and US News & World Report. 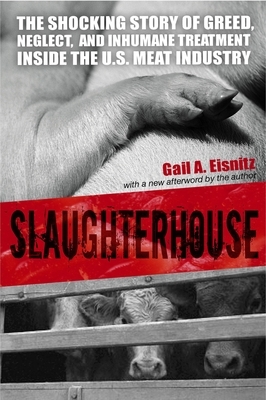 Eisnitz was the driving force behind a front-page exposé in the Washington Post documenting slaughterhouse atrocities. The Washington Post reporter later described Eisnitz as "the most courageous investigator I’ve ever seen." The story was one of the highest reader-response pieces ever run by the Washington Post. "As Eisnitz convincingly shows, the meat industry is indifferent to animal suffering, exploitative of its workers, and liable to produce a product that is riddled with dangerous bacteria. Whether you eat meat or not — if you care about humans or animals — this book is a must read." "This book penetrates the veil of psychic numbing that keeps us oblivious to the real truth behind modern meat. If you want to remain a prisoner of your own ignorance, don't read it. It will make you aware. It will wake you up. It will change your life." ."